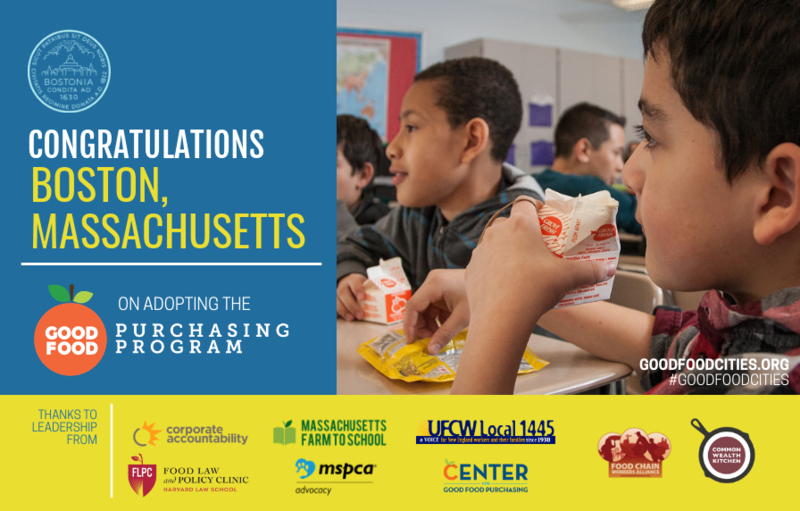 UFCW Local 1445 played an instrumental role in supporting the Boston City Council’s passage of the Good Food Purchasing Program on March 20. The program will transform the way public institutions, including Boston Public Schools, purchase food and put millions of dollars back into Boston’s regional economy. This is the second time this year that our union has helped to pass a food justice policy. UFCW Local 75 helped to pass the Good Food Purchasing Program in Cincinnati on Jan. 28. Boston’s Good Food Purchasing Program encourages food suppliers to provide healthier food that is ethically produced, locally sourced and environmentally friendly. The policy also protects workers’ rights to organize a union free from intimidation and helps ensure that farmers receive a fair price for the fresh food they produce. UFCW Local 1445 was part of a community-based coalition that included other unions, as well as faith, policy and student groups, and environmental and animal welfare organizations, which advocated for the program.